Yep, that’s a frozen Dam. I was always under the belief that dams don’t freeze in the winter time because they are always turning out enough water to keep it warm enough from freezing. This is true in the case of Ennis Dam. Well, Holter Dam apparently wasn’t turning out that much water and it froze. That’s okay because it made for one really cool backdrop. Dam’s are a unique feature in photographs I find because it’s having to mesh the human-made world with the natural world and that doesn’t always work. Dan acted as my model for this shoot and even though he was backlit the bright backdrop made it so that he popped. 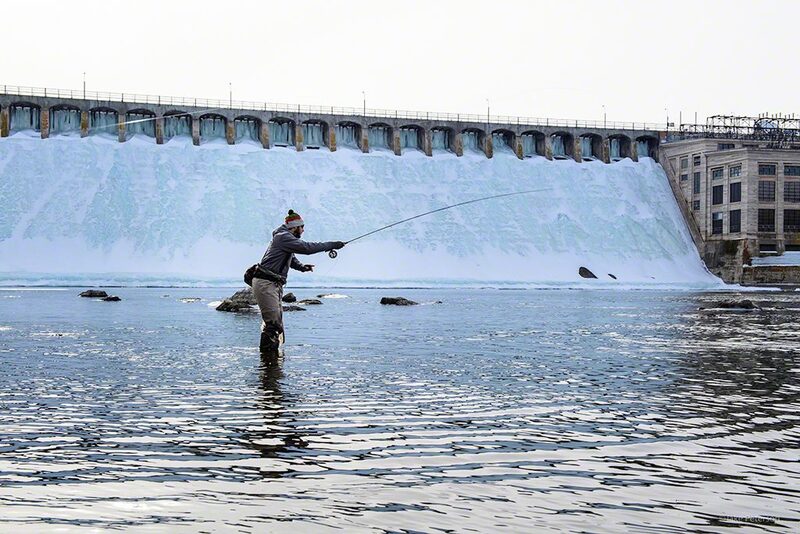 No one thinks about fly fishing in the winter time but it is one of the best times to be fishing and the photography seems so unusual that it makes it interesting. ← Spring Fishing is Almost Here!